I am pretty sure I say this every year, but I really can't believe that it's the end of another year already... 2013 is almost over... This year though, I'm kind of glad in a way. 2013 has been a tough year on a personal level and I'm looking forward to 2014 with hope that it will be a better year! When it comes to cooking though, 2013 was great. This is the third time I've done this end of the year "best-of" post and it's always a challenge. I'm picking my favorite recipe for each month and sometimes it's difficult to pick just one. Sometimes it's based on taste, but sometimes it's based on trying a new technique or stretching my abilities and/or palate. I wish all of you a very Happy New Year! I hope you enjoyed 2013 and look forward to much more food, recipes, and conversations in 2014. Italian spaghetti squash bake: I chose this dish because it was this first thing I made with spaghetti squash that really changed my mind on this winter squash. It was never my favorite winter squash - I would make it as a gratin and liked it, but when I made it this way, I loved it. Now I make spaghetti squash recipes all the time. I'm back with a recipe for week 8 of the 12 Weeks of Winter Squash. With all the holiday recipes and general craziness of the season, I missed week 7 - hopefully I'll be able to do all the remaining weeks though. It's the time of year when we try to eat from our freezer and pantry a lot, including a big stash of winter squash and all the goodies I canned the past year. We ate these patties with some pork chops and green tomato and apple chutney. All the flavors went together perfectly! I spiced these spaghetti squash patties to compliment the chutney, but you could use other spices as well -- spaghetti squash really provides a blank canvas for flavors. The idea for these patties was inspired by a recipe I saw a while back from Sprigs of Rosemary. I thought it would be a delicious way to enjoy some of our spaghetti squash stash and I was correct. 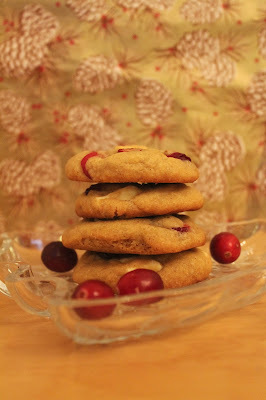 I had a bag of fresh cranberries sitting in my fridge that I really wanted to use to make a Christmas cookie. I also really wanted to pair them with white chocolate - not only because it's a tasty combination, but also because of the red and white colors. I found this recipe that used dried cranberries and I was sold as soon as I saw the words "brown butter." Brown butter is a magical thing that immediately lifts any recipe to a higher level. 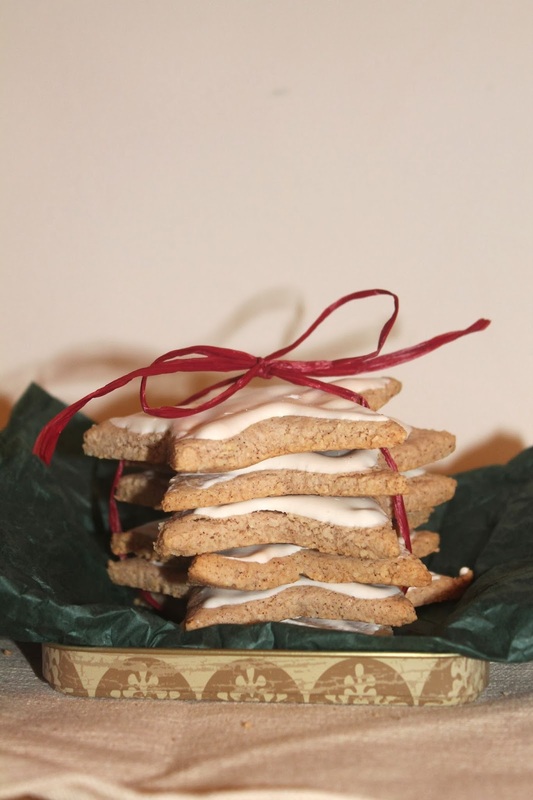 The butter gets so nutty and has a wonderful aroma - it's really perfect for the holidays. I also wanted to use some ginger in this cookie to make it even more festive (plus I love cranberries and ginger together). The result is a delicious cookie that is chewy and nutty with a hint of warmth followed by creamy chunks of white chocolate and tart pops of cranberries. Below is my slightly adapted recipe that I also halved because I was making so many other cookies! This recipe will make about 26-28 cookies. I think this will be my last post until after Christmas. I hope everyone is having a wonderful holiday season full of happiness and great food! I guess I'm a little behind this year when it comes to cookie baking. I have my list ready of the ones I want to make and these German cinnamon stars (Zimtsterne) were at the top. I found them in The German Cookbook and when I did a little research, it looks like they are very popular in Germany. These cookies only use a few ingredients and are gluten-free and don't contain any butter. About halfway through the process, I really thought I was going to be throwing away the batter, because it just wasn't coming together. I kept adding more and more almond meal and it was still too sticky. Just when I was about to give up, I added another 1/4 cup and the dough came together. I had to adjust the cooking time because they were getting too dark. However, once I worked out all the bugs, they turned out to be some neat cookies. If you like meringue, you will like these as each cookie is spread with a meringue topping before baking. The topping comes out crisp with a chewy cookie. All in all, I don't think I'll be adding these to my regular Christmas baking rotation, but every few years, I will make these. My adapted recipe is below and it will make about 30 cookies using about a 3-inch star cookie cutter. This cake was supposed to be for my husband to take to a holiday potluck. But, due to the very snowy weather, it was postponed. So, we had to make a sacrifice and eat this cake so it didn't go to waste :-) - it was totally worth it. This cake is so delicious. It's moist, crumbly, and tastes very much like eggnog without being overpowering. I had an idea to make an eggnog cake for a while now and then I found this recipe, which I adapted for this version. This cake is a great dessert to make for a holiday gathering - it's pretty simple to make and it's very festive. It goes well with a hot cup of tea or coffee while sitting by the Christmas tree and watching the snow fall outside. Congratulations to Denise Beyers who is the winner of the reCAP Mason jar lids from my 4-year blogiversary giveaway. I used the random number generator to chose the winner. I will send you an email and ship your lids soon. Thanks to everyone who participated! I'm behind this week on my posting of something for the 12 Weeks of Winter Squash (Week 6). I was busy with my blogiversary post and giveaway (you can still enter through Friday 12/13) earlier this week, but I was hoping to squeeze in a winter squash recipe before the end of the week. We had the hugest butternut squash I have even seen. It came from my father-in-law's garden and was just really massive. We used 1/3 of it to make a side dish for Thanksgiving (that produced leftovers) - that's how big it was. So, needless to say, we've been eating a lot of butternut squash. I threw this pasta dish together using a lot of leftovers -- more of the squash, some chicken, a hunk of mozzarella, etc. It was a really satisfying and tasty pasta dish and was a perfect meal for a cold and snowy evening. This dish will feed about 4-6 people, so we had a lot of lunch leftovers (my favorite). Today marks my 4 year blog anniversary (aka blogiversary) and it has inspired me to do my first ever giveaway. I'm giving away two reCAP Mason jar lids (one wide mouth and one regular mouth) to one reader. The details and rules are posted below. I'm loving learning to can and preserve and have also been trying my hand at fermenting. I'm learning that it is definitely an art. 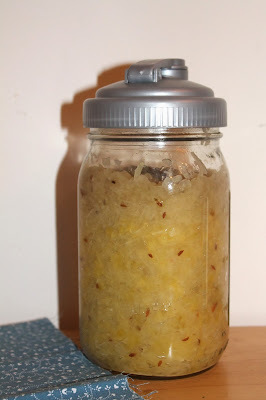 I tried a couple batches of sauerkraut this fall and recently pulled them out of the back of the fridge to give them a smell and taste. They are good, and definitely have a funk that you expect from ferments and sauerkraut. I think that I still have a way to go before "perfecting" my ferments though. I'm finding that so much depends on the temperature when you start the ferment. You need to check it to make sure it's still bubbling and that it's not getting too warm (should be room temperature). 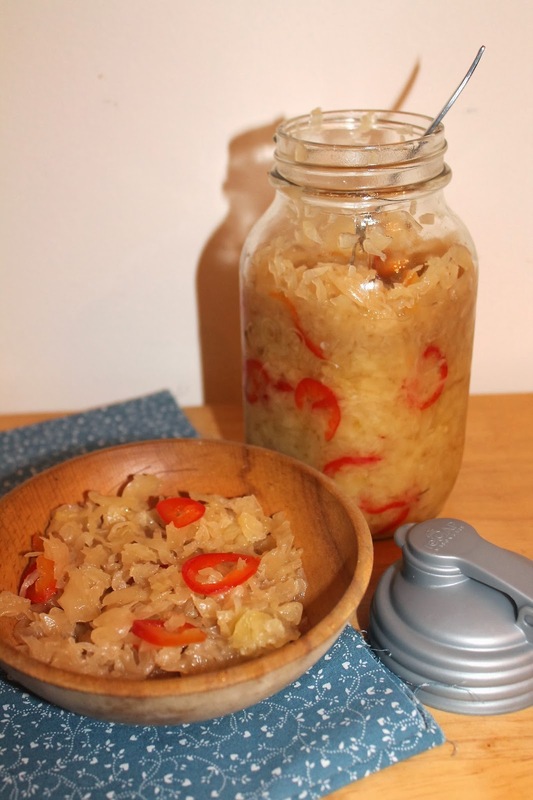 I have used the recipes in Nourishing Traditions as a baseline for making my sauerkraut. These recipes make one quart and use 1 medium head of cabbage to two tablespoons of sea salt. It can come out a bit salty and I'm hoping to find ways to use less -- you definitely don't want to use a super fine grain salt, it will be too much. I discovered that you can use reCAP Mason jar lids to turn a Mason jar into a fermenting crock (find instructions here). It's great! Plus when you finish the fermenting process, you can use them to cover the jars in your fridge, or replace them with a regular Mason jar lid and use the reCAPs to make more ferments. They are also great for using your jars to make salad dressing, syrups, etc. that you can easily pour and store. The two sauerkraut recipes I made are for jalapeno kraut (above) and caraway kraut (below). Both make 1 quart of sauerkraut. I'm hoping that these recipes and lids will inspire more people to try fermenting and preserving foods. Thank you to all of my readers and fellow bloggers who have helped me to stick with this process for four years now! I never imagined keeping this blog going so long, but now I can't imagine not doing it. You are all great and I am continually inspired by all of you! Thank you! I've never really liked "grape flavored" foods, but I've always loved eating fresh grapes. As I've gotten older, I've started to really enjoy foods made from real grapes like jelly or juice (or wine), but I still can't stand anything grape flavored (e.g., fake grape flavors in candy). For the past couple of years I have been wanting to make a concord grape pie. We live in an area surrounded by grape growing and wine making, and I guess grape pie is pretty common (although I had not seen or tasted it in real life before I made this tart). But, I was intrigued by the idea of it and during the peak of concord grape season, I prepared the filling and froze it to make a different pie for Thanksgiving this year. It ended up being a tart because I had less grapes than I needed to make a pie -- but it worked out well because the grapes are so sweet, that the layer was thick enough for me! Everyone enjoyed this tart and the grape flavor was so bright and pronounced. I highly recommend saving this recipe for next fall and giving it a try! If you want to have it at your next Thanksgiving dinner, you can freeze the grapes after they cool and then just stir in the remaining ingredients after they thaw. This recipe will make one 9-inch tart. Delicious, creamy steel-cut oats are even better when they are cooked with pumpkin puree, maple syrup, and spices. It makes for a hearty and hot breakfast that is perfect for a cold morning. I make these oats quite frequently during the cold months - basically whenever I have leftover winter squash puree. This time I used pumpkin, but you could use butternut, buttercup, hubbard, kabocha, etc. I had some leftover fresh pumpkin puree from making my pumpkin pie, so it was a perfect time to share this recipe with the 12 Weeks of Winter Squash. This is week 5 and you can join anytime just by linking up your winter squash recipes using the linky at the bottom of this post. This recipe will make two large servings of oats. If you haven't started using steel cut oats versus rolled or instant yet, I highly recommend giving them a try. They take a bit longer to make, but have a great texture and heartiness that the others don't have.